For large groups wanting extreme luxury, the oceanfront Ani Villa Estate is a perfect choice. There are two separate villas, each with their own private pool, common areas, and five-star amenities. A full staff on the property will ensure that all your needs are met, and Ani Villa is also conveniently located to lots of island attractions should you want to explore. The beach is just 5 - 10 minutes away for swimming and snorkeling, and groceries and restaurants are also nearby. Exclusive, luxurious getaway for a large group or family. 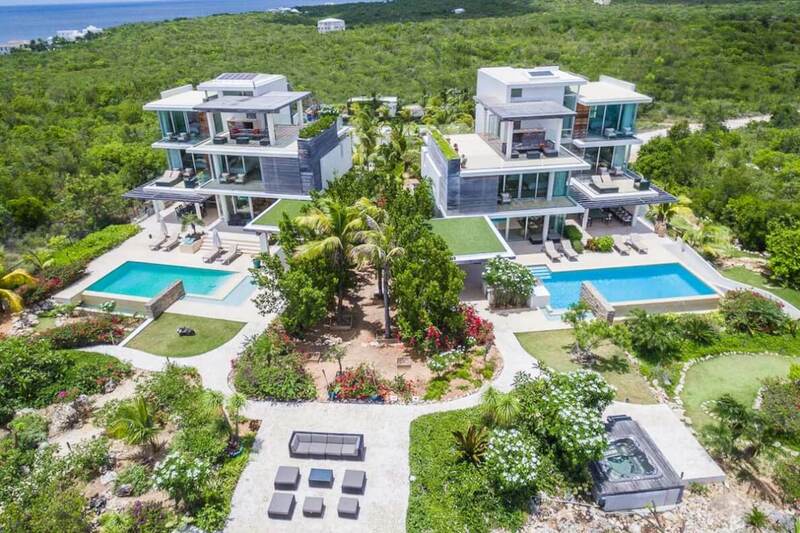 Ani Villa Estate is a 10-bedroom luxury estate consisting of two separate villas, a picturesque cliffside location, and a shared gym and tennis court. Both villas have access to the private staff, which includes a concierge, beach butler, housekeeping, and security. Each of Ani Villas’ luxury homes has its own pool, hot tub, kitchen, indoor and outdoor dining areas, lounges, and decks, and is available for rent individually. In addition, guests can rent the wedding pavilion for special events. The wedding pavilion can accommodate 30 people for a sit-down dinner or 150 people for a cocktail party. The beach butler is another luxury feature— this staff member will set up chairs, umbrellas, and a cooler on guests’ beach of choice. Guests have complimentary afternoon refreshments, a daily meal from a private chef, pool service, and Continental Breakfasts. In both villas, enjoy the Sony sound system and Apple TV in the living room and the ocean views from the open lounge. The fully-equipped kitchens, formal dining rooms, dining pavilions, and cliff top decks round out the common areas. Ani North is unique thanks to the home’s dramatic stair atrium with a massive skylight above and a water feature below. Ani South is unique because the design is fully handicap accessible with an elevator, roll-in showers, pool lift, and more. Ani South also has a game room with a pool table, shuffle board, board games, and a Wii. All ten bedrooms have goose down comforters, a private balcony, and ensuite bathrooms with toiletries, robes, bath salts, and hair dryers. Ani Villa North has three Master Suites with king beds and a Guest Suite with two full beds. Two Masters and the Guest Suite are on the second floor, and one Master is alone on the third floor. Ani Villa South has a Garden Suite on the lower level, with two twins that can be converted into a king and its own living area. The ground level has a Master Suite detached from the main house, and the second level has two Master Suites and a Twin Suite. The uppermost level has a Master Suite. Ani Villa Estate is in a central, private region of the island near Cedar Village. Guests have golf cart access to three neighboring beaches, and several others are a short drive away. Gourmet meals including Breakfast and choice of Lunch OR Dinner (Half Board), All-day snacks, cocktail service and Mini bar; Premier spirits, house wines, soft drinks and juices; Beach Butler service —world-class pampering on your choice of Anguilla's divine beaches, totally hassle-free; 2, 1-hour Massage Treatments per day; Full use of the estate's facilities and amenities, including cliff top hot tubs, infinity pools, fitness center, pair of 6-seater golf carts; Daily Children's Activity program; tennis lessons and hitting partner; Watersports equipment access (paddle boards, snorkel, etc. ); Mountain bikes; Laundry; Complimentary International calling; High-Speed Wifi; Sonos Music System (Rhapsody) and Unlimited Apple TV and Move Downloads.